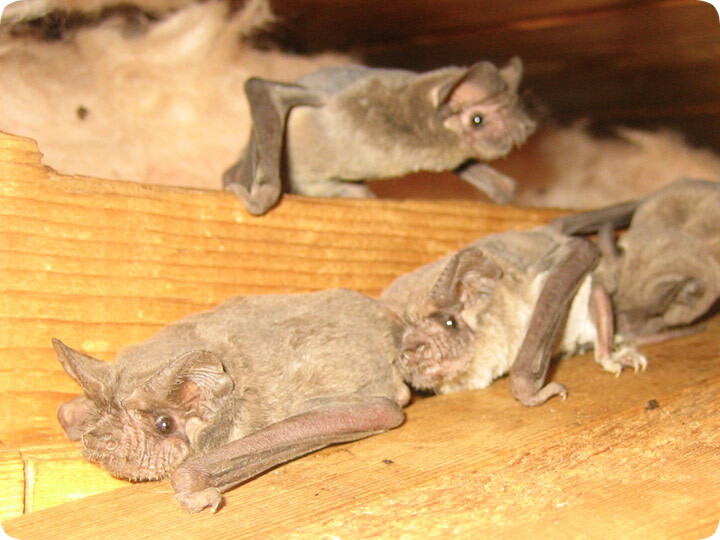 04.15.2004 - I took this photo at a bat project last night, in which a lawyer's building was filled with over a thousand bats. To my great surprise, the owners of the firm left the problem go for many years until they read a story about a lawsuit filed in Connecticut over contraction of histoplasmosis from bat droppings in a public building. Then they wanted to kill the bats, until they were informed that this could result in fines from the Florida Wildlife Commission. Finally, they decided to pay to have me remove the bats carefully and properly. Some say the lawyer's hearts grew three sizes that day. Yesterday. I like this photo, because it features a common bat behavior that some find very cute - their tendency to march single-file toward the exit. I've been to movie theaters and sporting events, and let me tell you, humans haven't mastered this trait. However, mother nature has instilled a nice sense of orderly procession in these fine specimens, so when it's time to take off for the night, they all crawl to the hole bumper to bumper. I also noticed that this photo showed the bat's pupil, something I've never seen in a bat photo before. So, how does one solve a bat problem? My honest advice is to do what the lawyers did - call a professional. Whatever you do, make sure that professional has experience with bat removal, and that none of the bats will be harmed in the process. I know, from the photo they don't look like the cutest of creatures. However, they are not dangerous, they will not attack and bite your neck and give you rabies or vampirism. The worst they will do is leave behind lots of droppings (also known as bat poop) and bat urine (also known as Miller Light). Getting them all out of the attic is a burdensome chore, and one that requires a great deal of experience. However, I'm confident that they will all leave the building thanks to me, and they'll do it single-file, by golly.